Located in Morong, Bataan in Central Luzon, the Bataan Nuclear Power Plant (BNPP) is the first proposed nuclear plant in the country and the only one in the Association of Southeast Asian Nations (ASEAN) as of 20141. The municipality of Morong is home to almost 30,000 people according to the 2015 census2; among this population are Aeta communities. The Philippine Atomic Energy Commission (PAEC), established under Republic Act 20673, paved the way for the construction of the Bataan Nuclear Power Plant in 1976. Following an oil crisis in 1973, former President Marcos deemed it fit as an alternative energy source and ordered a presidential committee to secure the implementation of the nuclear plant, involving the procurement of two nuclear reactors. Controversy engulfed the project mainly due to Marcos’ ties with American manufacturing corporation Westinghouse Electric and other dubious, ill-founded rulings. Grave cases of corruption were discovered within the collaboration. The Westinghouse contract with the Philippine government, with the latter having other cheaper options at the time, went from roughly 650 million USD to 2.2 billion USD for just one nuclear reactor4. It was later discovered that large sums of money were also going to President Marcos and his cronies5. The communities residing in the vicinity have been contesting the project since its conception. Its impact on the human person alone is already enough to stir reluctance and worry. The health effects of radioactive contamination and exposure range from short-term (e.g. cutaneous radiation injury) to long-term (e.g. cancer)6; this is caused by the ionization effect of radiation. Aside from the physical consequences of exposure to radiation is a more insidious and incapacitating impact, that which harms a person’s mental health. It was found that people who have gone through radioactive contamination or exposure developed psychological illnesses such as PTSD, depression, and anxiety7. On the other hand, its negative impact on the environment includes the degradation of living organisms which will lead to the substantial disruption of ecosystems. With this, the list of tangible risks of having a nuclear plant goes on. The plant sits atop a Quaternary volcanic province called the Pampanga Lineament comprising at least 27 volcanoes8. Three volcanoes – the dormants Mt. Natib and Mt. Mariveles and the active Mt. Pinatubo – are within relevance to hazard assessments of the project, making it very exposed to seismic and volcanic calamities. According to studies by University of Illinois Department of Earth and Environmental Sciences professor emeritus Kelvin Rodolfo and others in 2012, the plant fails to meet the standards established by International Atomic Energy Agency because of its susceptibility to two types of geologic hazards—pyroclastic density currents and lava flows9. According to Rodolfo, these are geological hazards no technology will be able to avert. The mere exposure to radiation already threatens human safety and derails environmental sustainability—what more a nuclear mishap that can resemble the likes of the past tragedy at Chernobyl? The obstinance of the government begs to be interrogated. Opposition to the project was led by the scientific community and the residents of Morong until it was shelved by former President Corazon Aquino after Marcos’ ouster. The activation of the plant was mothballed due to the Chernobyl catastrophe in Russia involving a power plant similar to the BNPP and the corruption cases that trailed its way to Marcos10. 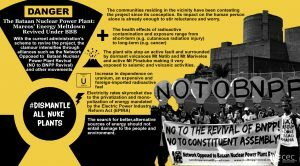 With the current administration’s scheme to revive the project, the clamour intensifies through alliances such as the Network Opposed to Bataan Nuclear Power Plant Revival (NO to BNPP Revival) and other movements. We denounce the attempts to revive a glaring remnant of Martial Law and an emblem of corruption. Duterte’s ‘Build, Build, Build’ program—a series of big-ticket projects with foreign funding—parades itself with a facade of infrastructural development when all it truly leads up to is a waste of the taxpayers’ money and an intensified threat to poor communities. ‘Build, Build, Build’ is constructed ultimately on an elite-serving agenda, with Duterte merely representing and lobbying for the interest of the few. Instead of proper distribution of basic social services, genuine agrarian reform and modernization, and national industrialization, the current administration pursues profit, much like its sleazy, despotic predecessors. These are all further exemplified in the administration’s scrambling to justify these foreign investments despite opposition heavily backed by the scientific community. The push for the rehabilitation of BNPP has been backed by cherry-picked science and grossly dismisses the verifiable repercussions to the communities and environment. For example: introducing nuclear energy to the power industry will mean an increase in dependence on uranium, an expensive and foreign-imported radioactive fuel11; this renders the claim that BNPP will be able to supply cheaper energy dubious. In addition to this, development aggression is willfully employed which threatens the well-being of the people when its purported objective is to provide for them. With these projects, there should be a comprehensive review of the risks and material impacts. Aside from the people directly affected by development aggression (e.g. people having no choice but to be exposed to radiation), the ‘progressive’ project also imposes additional burden on all consumers of electricity. Electricity rates skyrocket due to the privatization and monopolization of energy mandated by the Electric Power Industry Reform Act (EPIRA). If its quest to look into alternative energy sources is genuine, the government should rid of corporate ownership and control of the nation’s energy industry. The answer is not to commercialize development projects meant to provide basic services such as electricity, but to nationalize them and utilize this as a vital and strategic step for national industrialization. The search for better, alternative sources of energy should not entail damage to the people and environment. Terry, J. P., & Goff, J. R. (2012). Natural hazards in the Asia-Pacific region: Recent advances and emerging concepts. London: Geological Society of London. Census of Population (2015). Region III (Central Luzon). Total Population by Province, City, Municipality and Barangay. PSA. Retrieved 19 September 2018. Salaverria, L. B. (2012). Nuke plant bribery: PCGG wants Marcos, not just Disini, to pay”. Inquirer. Retrieved 19 September 2018.